For several years now, Disney has been running a promotion at various times throughout the year offering guests a free Disney Dining Plan with paid vacation packages. Nicknamed “Free Dining” by Disney fans, the promotions typically fall during less busy times of the year. What is the Walt Disney World Free Dining Offer? During times of the year when attendance is forecasted to be lower, Disney has, since 2005, offered guests free Disney Dining Plans when they book a Disney Resort hotel stay and Disney theme park tickets. Offers for Free Dining are normally announced via email. Disney routinely makes the offer first to Disney Visa Cardholders, and it’s opened up to the general public a few days later. If a Free Dining promotion is not offered during your vacation dates, you may get lucky and receive a “free dining PIN code” in the mail or email from Disney. To receive the offer, you must opt in to receive special offers and discounts through Disney’s website. 2019 Disney World Free Dining is Here! On January 2, 2019, Walt Disney world announced the 2019 Disney World Free Dining offer! Booking is available through February 10 for the following dates: July 5 – September 30, 2019. Read more about 2019 Disney World Free Dining Here! 2019 Disney World Free Dining for Canada Residents is Here! Walt Disney world announced the 2019 Disney World Free Dining offer! Booking is available through February 10 for the following dates: July 5 – September 30, 2019. 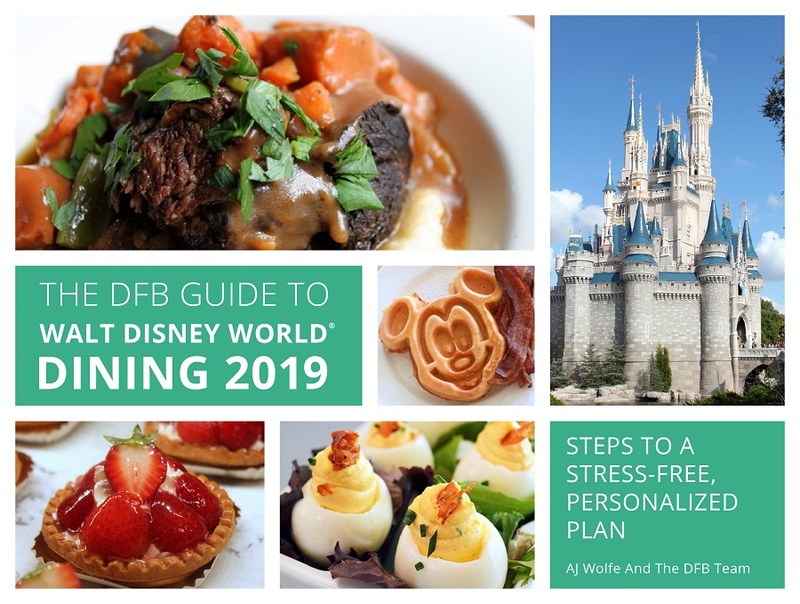 Read more about 2019 Disney World Free Dining Here! 2019 Disney World Free Dining for UK Residents is Here! In mid-April, Walt Disney World announced the 2019 Walt Disney World Free Dining Offer for residents of the United Kingdom! This deal must have been booked by November 6, 2018, for arrivals between January 1 – April 7, 2019 and April 26 – November 30, 2019. 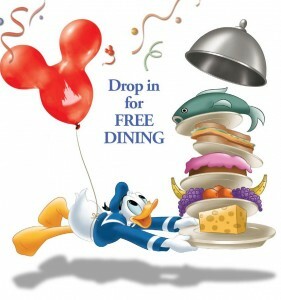 Currently, FREE DINING is the bounceback offer for guests at Walt Disney World Resort Hotels! Available dates are May 28 – June 4, 2019; June 28 – September 27, 2019; and December 6-24, 2019. You must have a minimum 4-day stay and purchase a minimum 4-day Park Hopper ticket. Excluded resorts are: All Star Movies, Art of Animation Little Mermaid Rooms, Port Orleans French Quarter, Bungalows at Disney’s Polynesian Village, Cabins at Copper Creek, the Villas at Disney’s Grand Floridian, and Bay Lake Tower. The bounceback offer is available to anyone staying onsite at a Walt Disney World Resort Hotel – all you do to get it is dial x8844 from your hotel room phone and ask for the bounceback offer! How Does the Free Dining Plan Work? To take advantage of a Free Dining offer, guests must book their travel dates during specified windows of time. In the past, the general timeframe during which Free Dining has been offered has been late Summer and early Fall, and during mid-Winter after the holidays have wrapped up. Generally, guests must book a minimum hotel stay in a Disney resort. During recent offers, the minimum stay has been 3 nights. In addition, guests must also purchase AT LEAST a 2-day Magic Your Way Disney World ticket with Park Hopper or Park Hopper Plus. Room and ticket purchases are required for each person in your party. If you reserve a Moderate, Deluxe, or Deluxe Villa Resort, you will receive the Standard Dining Plan for FREE. (You can upgrade to the Deluxe Dining Plan by paying the difference in cost per night.) In 2018, guests at Moderate Resorts received the Quick Service Dining Plan. The Free Dining offer normally cannot be combined with other discount offers such as discounts on room rates. To learn more about the 2019 Free Dining Offer visit this page. How Do I Book Free Dining? You can book a Magic Your Way package on the Walt Disney World website, over the phone at 407-WDW-MAGIC, or through an authorized travel agent or vacation planner. What Do I Do If I’ve Already Booked My Trip and I’d Like to Take Advantage of the Free Dining Offer? Check with Walt Disney World directly by calling 407-WDW-MAGIC, or by contacting your authorized travel agent or vacation planner. They may be able to update your vacation package. Is Free Dining the Best Deal for My Family? Because of the restrictions on the Free Dining offer, the answer to this question is…probably. 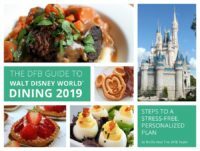 To help you compare and determine if Free Dining will save you money, we break down and compare the costs and options for several Disney World discounts, including the Free Dining offer, in our fully updated DFB Guide to Walt Disney World® Dining 2019 e-Book to help you save the most money possible. Our convenient e-Book offers a full chapter on your Disney budget and ways to save on Disney Dining. We include in-depth analysis of various offers to help you determine which will save you the most money. You can order the 2019 Edition now! 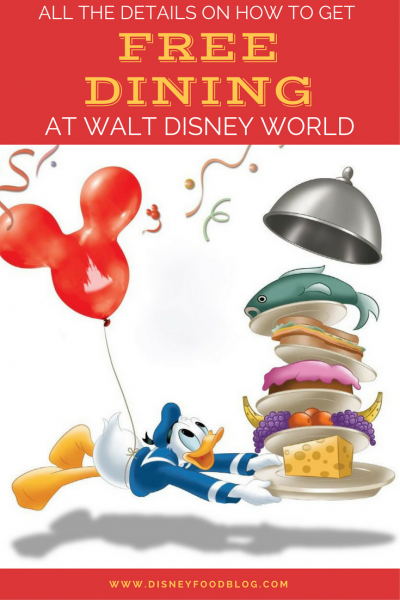 Along with over 700 pages of great Disney World dining advice, full color photos, and details, this book is a great deal — with a 100% money-back guarantee. Lily on 50 Memories You Should Make Before Walt Disney World’s 50th Anniversary!